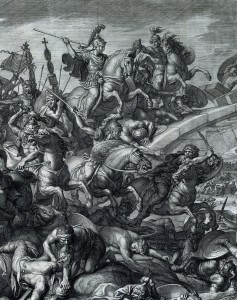 The Battle of the Milvian Bridge took place between the Roman Emperors Constantine I and Maxentius on October 28, 312. It takes its name from the Milvian Bridge, an important route over the Tiber river. Constantine won the battle and started on the path that led him to end the Tetrarchy and become the sole ruler of the Roman Empire. 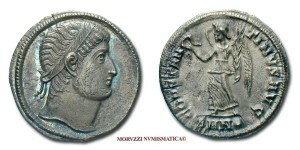 Maxentius drowned in the Tiber during the battle; his body was later taken from the river and decapitated, and his head was paraded through the streets of Rome on the day following the battle. According to chroniclers, the battle marked the beginning of Constantine’s conversion to Christianity. Eusebius of Caesarea recounts that Constantine and his soldiers had a vision sent by the Christian God.